Renowned British map dealer, scholar, and author Philip Burden made an exciting discovery at the Admiralty Library in Portsmouth, UK. Burden discovered four previously unrecorded small charts of locations on the east coast of North America, bound within an extremely rare small atlas by Philip Lea. Although John Lawson served as surveyor general of North Carolina during the first decade of the 18th Century, only one published map had been attributed to Lawson prior to Burden’s discovery. I obtained an image of the “Ocacock Inlet” map on a recent visit to Portsmouth. There is no engraver, printer, or location imprint on the map. However, Lawson was in London in 1709, overseeing the publication of A New Voyage to Carolina, and it’s apparent from the date on “Ocacock” that he drew the map while in London. 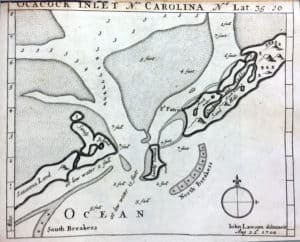 In 1709, John Senex engraved the general map of Carolina for Lawson’s book, so it is reasonable to assume that he also engraved the small map of “Ocacock Inlet”. In Lea’s atlas, Herman Moll’s name is found on some maps; therefore, he cannot be discounted as engraver of “Ocacock”. Perhaps someone with a more intimate knowledge of the engraving styles of Senex and Moll can offer support for one or the other. Questions? Comments? Corrections? Please use the “What’s on your mind?” comment box below. A fifth example of the Hydrographia Universalis was discovered by the author in the Admiralty Library, Portsmouth (Vg3). Although this example includes four unrecorded charts of America we can date it to c.1702 from the events depicted. Therefore it is likely they were all issued after 1700. Amongst the new charts is one entitled ‘A New Map of the Harbour of Charles Town’ derived from the John Thornton and Robert Morden c.1695 map of South Carolina. The remainder illustrate Port Royal, St. John’s Bay recording the attack of Governor James Moore on the town of St. Augustine in 1702 and finally Ocacock Inlet which notes ‘John Lawson delineavit Aug 22d. 1700’’[sic]. Further research needs to be undertaken on the latter as it appears Lawson only reached Charleston from London on 15 August that year. From Burden, Philip: UPDATE TO ‘THE MAPPING OF NORTH AMERICA’ Volumes I and II (Entry 726 is found on p29 of the January 2018 version of the pdf). Burden mistakenly transcribed the “Ocacock Inlet” date; it is actually Aug 22d. 1709. Therefore, the Admiralty Library’s copy of Hydrographia Universalis was issued no earlier than 1709. This entry was posted in 18th Century and tagged Herman Moll, John Lawson, John Senex, Ocacock, Ocracoke, Philip Burden, Philip Lea by crmaps. Bookmark the permalink. Ocracoke is a favorite place to visit – interesting to see the relative stability of the Portsmouth side versus the changes leading to Silver Lake. Thanks for finding and sharing! Inlet appears in detail on Mosley’s 1733 “New & Correct” Map. Borrowed fm Lawson? I had the same thought, but Moseley’s inset doesn’t appear to be derived from Lawson’s map.